ASTANA – Kazakh-Uzbek trade grew 50 percent in the first quarter of 2018 compared to the same period last year and the countries are working to grow trade to $3 billion by the end of the year, said Kazakh First Deputy Prime Minister Askar Mamin during a May 4 working visit to Tashkent, Uzbekistan. Mamin also told Uzbek President Shavkat Mirziyoyev in a meeting that the two countries are working to increase trade to $5 billion by 2020. “We have all the necessary opportunities and potential to do this. We need to make use of all the possible reserves, and the Intergovernmental Commission is currently working to tackle this issue,” he said in an interview with the O’zbekiston 24 television channel, noting Kazakhstan and Uzbekistan are observing a boom in bilateral relations in virtually all the sectors of the economy. Uzbekistan is Kazakhstan’s largest trading partner in the region and the partner with whom Kazakhstan has experienced the highest rate of trade growth, Mamin said in the television interview. Trade and economic cooperation, especially on a regional level, were one of the main topics Mirziyoyev and Mamin discussed. The Uzbek leader noted the role of the March 15 Heads of Central Asian States Consultative Meeting in Astana in developing regional cooperation. Mirziyoyev and Mamin also discussed plans for the first Regional Economic Forum of Central Asian States in 2018 in Tashkent. The decision to hold the forum, initiated by Mirziyoyev, was adopted at the last consultative meeting. “We are confident that holding this forum and then the meetings of the working group at the level of deputy prime ministers to prepare for the next meeting at the level of heads of Central Asian states will lay a solid foundation and create opportunities to develop regional economic interaction,” Mamin said in his interview for O’zbekiston 24. 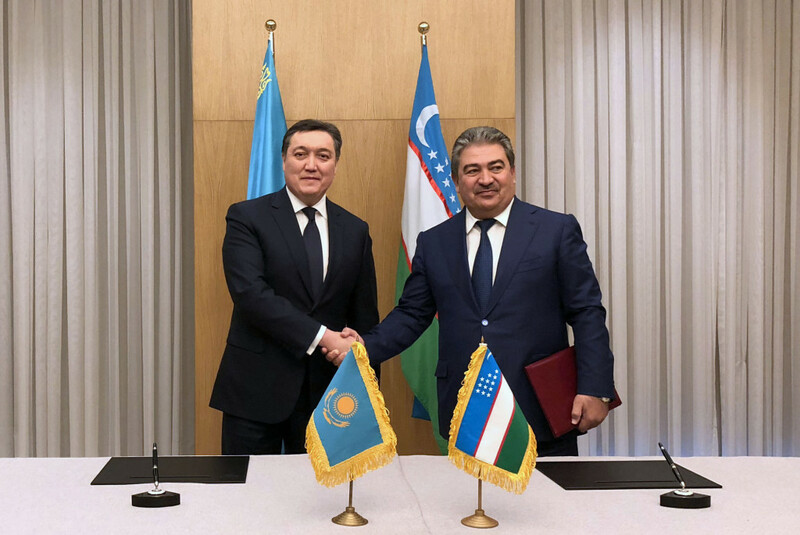 During Mamin’s visit, an agreement was also reached to hold the first Kazakh-Uzbek Interregional Forum in Astana and the first meeting of the Business Council and the joint business forum in Shymkent. “The interregional forum will provide an opportunity to enhance horizontal cooperation at the level of our regions. There is a big number of projects at that level that can be implemented jointly, and they are currently being elaborated,” Mamin commented in his interview. The sides also discussed boosting investment cooperation, implementing joint investment projects to gain access to third country markets and taking additional steps to facilitate cooperation in construction, engineering, transport, logistics, tourism, space and the military sectors. 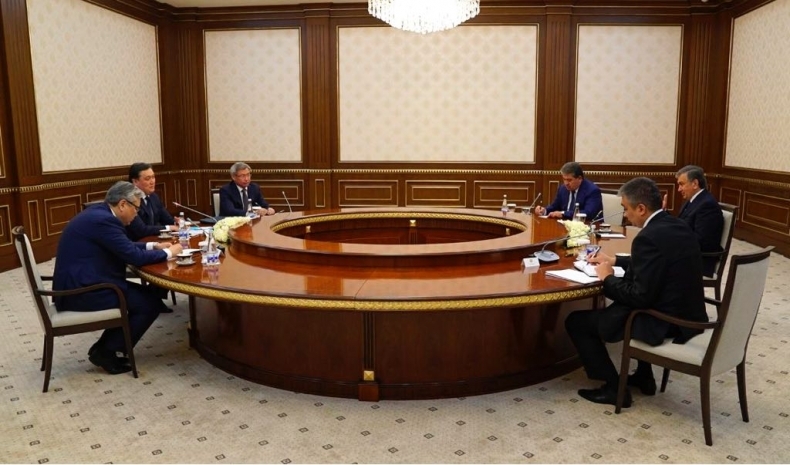 The trip also included a working meeting of the co-chairs of the Joint Intergovernmental Commission on bilateral cooperation Mamin and Uzbekistan’s First Deputy Prime Minister Achilbay Ramatov. Askar Mamin (L) and Uzbekistan’s First Deputy Prime Minister Achilbay Ramatov (R). The meeting highlighted the systemic character of trade, economic and investment cooperation between Kazakhstan and Uzbekistan. Joint trading houses operate in the core sectors of the economy, such as agriculture, petrochemicals, pharmaceuticals and engineering. The countries have experienced recent bilateral trade growth and are working to implement large-scale infrastructure projects. The sides also agreed to hold regular working group meetings to increase trade. Mamin said Uzbekistan’s easing of certain excise taxes has increased trade and urged the Uzbek side to ease excise taxes on other Kazakh products with export potential. The sides agreed the two countries will ensure a supply of Uzbek natural gas to Kazakhstan’s southern regions in autumn and winter and will help transit Kazakh natural gas through Uzbekistan. The Kazakh official also proposed establishing the Central Asia International Centre for Cross-Border Cooperation (ICBC) on the Kazakh-Uzbek border. The centre would require infrastructure on both sides of the border. The two first deputy prime ministers also decided to create a joint working group to address the mutual recognition of visas for tourists from third countries crossing the Kazakh-Uzbek border to visit tourist sites along the Great Silk Route and to jointly promote tourism opportunities in both countries. Cultural and humanitarian cooperation are important components in Kazakh-Uzbek relations. This year has been declared the Year of Uzbekistan in Kazakhstan, while next year will be the Year of Kazakhstan in Uzbekistan. “About 200 events were planned within the Year of Uzbekistan in Kazakhstan; some of them have already been held and are gaining great positive response in Kazakhstan,” said Mamin in the interview for the Uzbek TV channel.